In the first part of this article series I covered pushing passive hyper extension for the back hip of splits, then in the second part I covered skin the cats / hyper flexion stretches. 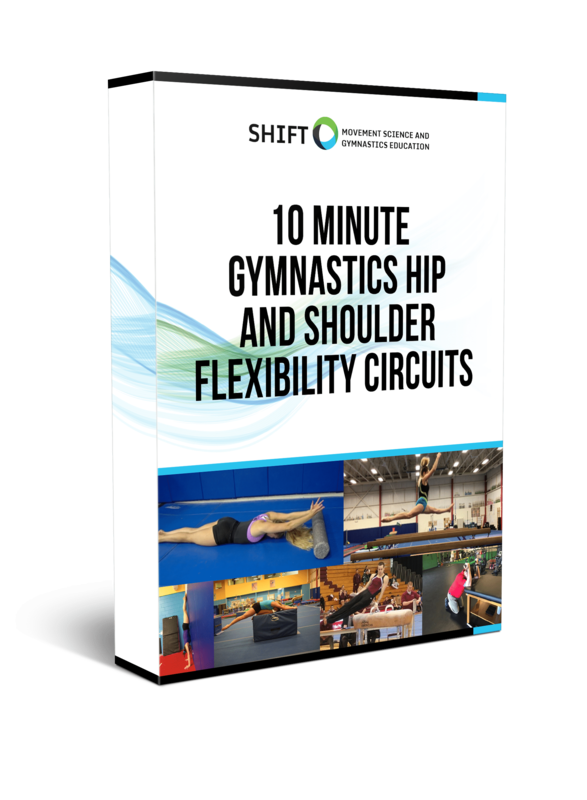 Also, before you dig in more, remember you can download literally all my thoughts on gymnastics flexibility, as well as the exercises and drills I use with gymnasts, for free here. Out of all the things I have seen in flexibility methods for gymnastics, the one that drives me the most insane is pushing knees into extension during splits or pikes. Although it’s not as common as the hip and shoulder post, I still have seen it quite a few times when in gyms. It blows my mind that people actually would push on knees for “better lines” at the cost of potentially increasing laxity in their knee and increasing the chance of a gymnast blowing ACL out during landings. Jumping and landing athletes are already at a huge risk for ACL tears, not to mention the even higher risk for young developing female athletes. When someone pushes a knee into extension, we strain the posterior knee joint, other passive stabilizers of the knee, and tension the ACL. Given that gymnasts already straighten their knees and tend to show very knee dominant landings (versus proper hip dominant squat deceleration landings), we really don’t want to putting them more at risk for landing lock legged and having something going seriously wrong. The ACL tear and knee injury rates in gymnastics are already high enough. It only takes one bad landing for the gymnast to suffer a major and possibly career ending injury. I strongly suggest people who may be unknowingly pushing knees down more in oversplits, or feet elevated pike stretches stop and think about why they chose to certain stretching interventions. Similar to that point, I would also be very careful about how much pressure the front knee of oversplits is taking, and if you use them try to have the gymnast move their front leg up on the mat more. We don’t want just the heel elevated with a long lever arm creating lots of posterior knee joint and ligamentous strain. Keep these points in mind, and as Dr. Josh Eldridge and I have said before it’s crucial that we make sure gymnasts are landing correctly. This goes for double leg and single leg. Here is a video of some single leg landings on beam we need to be looking out for and correcting. The second video shows better control with the same type of single leg landing. Smith et al. Risk Factors for Anterior Cruciate Ligament Injury A Review of the Literature—Part 2: Hormonal, Genetic, Cognitive Function, Previous Injury, and Extrinsic Risk Factors. Sports Health. 2012 Mar; 4(2): 155–161. Noyes FR1, Barber Westin SD. Anterior cruciate ligament injury prevention training in female athletes: a systematic review of injury reduction and results of athletic performance tests. Sports Health. 2012 Jan;4(1):36-46. The main reason coaches and gymnasts use knee stretching is due to a gymnast being unable to achieve straight knee lines and better form during leaps, jumps, and tumbling. Likely, the most common scenario here is that the gymnast has increased hamstring tone. The majority of gymnasts with increased hamstring tone I would say is due to protective guarding of an overly extended lumbar spine. If they live in this over extended, anteriorly tilted spine it is very easy for their hamstrings to always be “pre-loaded” with basic movements and especially during running/leaping drills. The hamstrings may just be turned on excessively to pull the gymnast out of a poor lumbar position. In this case however, the real issue is the lack of core control and not a hamstring tissue problem. As I wrote about in this post, we need to go up the road and correct the underlying issue related to core/spinal positioning during skills rather than keep chasing more splits and flexibility work for the hamstring. Some gymnasts may actually have true hamstring stiffness problems, and in this case I still never would go to pushing on a knee joint. Try some self-soft tissue work or light manual therapy, some leg lowering drills, dynamic warm up drills, and if needed some eccentric training as that has some theoretical support for truly adding sarcomeres in series (research can be found within article here). You can also put these drills into complexes to help improve overall split mobility, hamstring lengthening patterns, and gymnastics skills. If calf tissue is the goal for mobilization to increase pike stretch or in-bars, try soft tissue work daily before practice followed by more unloaded stretching and then strengthening of the anterior lower leg muscles. Remember we are obviously we are talking about a healthy, functioning gymnast. Gaining back knee extension with rehabilitative methods following surgery or injury is a completely different story. Even with that, I still support the notion that aggressive cranking on someone’s knee isn’t the best first option to use, and consistency more than intensity may be a better route. Increases in sarcomeres in series has to do with chronically engaging a muscle in it’s longest possible length…for instance, studies of muscle hypertrophy often involve hanging a weight from a quail’s fully lengthened wing, thus causing hypertrophy via sarcomeres in series of the latissimus Dorsi. Eccentric work is basically done in all normal contractions on land. ( contractions in water are purely concentric with no eccentric component.) The primary driver of increasing the length of a muscle by adding sarcomeres in series is chronically engaging the muscle in question in a lengthening contraction that takes the muscle close to it’s terminal endpoint…in order to prevent damage the muscle will then adapt by adding the sarcomeres to lessen the chance of myotendinous rupture. Hi Dave….I need to qualify my statement on water and eccentric contractions…of course there is some eccentric component if you are jumping or running in water, as your buoyancy relieves most of your weight but not all, depending on the depth of the water. I was thinking more in terms of upper body movements in a horizontal direction…my bad. I will get to the references as soon as I have a little lime, but one name you might want to look up is Steven Alway…..I worked with one of his doctoral students years ago who used the quail model in the lab I was in at the time.